That was the greeting from a lady who engaged me in conversation at the front of our house in Barnt Green. 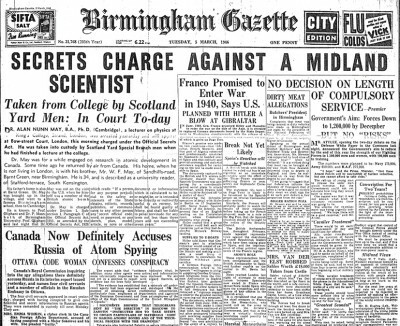 The spy in question was Dr Alan Nunn May, Lecturer in Physics at Kings College, London, who was arrested by officers of Special Branch outside the college on March 4, 1946. He appeared at Bow Street the following day and was charged under the Official Secrets Act and remained in custody until his trial at the Old Bailey in May that year. His name does not immediately spring to mind in connection with espionage. Klaus Fuchs, the Krogers, Burgess and Maclean are more famous and were to follow in subsequent years. But who was Alan Nunn May and what happened to him? He was born in Birmingham in 1911; his father was a brass founder and they lived in Moseley. By 1914 they had moved to Blackwell Road, Barnt Green, and Alan was educated at King Edward’s School, Birmingham, where incidentally he was photographed as a prefect alongside Enoch Powell. In 1930 he went up to Trinity Hall, Cambridge University, to study Physics. He gained a first, but more significantly he became associated with communist sympathies being propounded by leading academics at Cambridge, including JD Bernal, a physicist, and more importantly Donald Maclean, a contemporary at Trinity Hall. It was around this time that he joined the Communist Party, but remained a somewhat shy and retiring individual. He ultimately completed a PhD at Cambridge in 1936 and was appointed to a lectureship at Kings College in London. 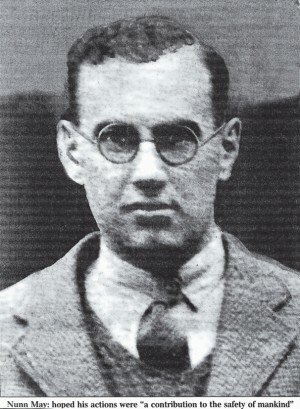 At the outbreak of war in 1939, he worked briefly on the secret radar project and then on the “Tube Alloys Project”, code name for the British effort on the possibilities of making an atomic bomb. In 1944, as one of a group led by a Dr Cockroft, he was sent to Canada to work on the Atomic Energy Project at Montreal, also visiting the heavy water pile at Chalk River, Ontario. It was during this period that he was approached by Russian agents. By 1945, he had supplied them with a sample of Uranium 233, details of an electronic shell used by the Americans against Japanese suicide pilots, and information about the first atomic test in the Alamagordo Desert, New Mexico. All this for the payment of two hundred dollars and two bottles of whisky. He was later to say that he refused payment and even burnt the money, but the Soviet agents insisted, and retained receipts which were to become damning indictments. In September 1945, Nunn May returned to England and to his lectureship at Kings College. However the Russian agents were not finished and Colonel Zabotkin, Military Attache at the Russian Embassy in Ottawa, set up a contact to meet Nunn May (codename Alek) outside the British Museum late one evening in October. Nunn May never kept the appointment, and it seems he had had enough of the whole business. This would probably have been an end to the matter, but on the night of September 5, 1945, Igor Gouzenko, a cypher clerk in the Soviet Embassy, Ottawa, defected with a number of secret files. He initially took his information to a leading newspaper but was not believed. His next door neighbour, who just happened to be a sergeant in the Canadian Air Force, did believe him, and gave him protective shelter. The authorities found themselves with “the largest and most dangerous spy plot ever known in the Dominion” and it led to numerous arrests of Canadians in government and the forces. It is likely that those files contained information relating to Alan Nunn May, which was relayed to MI5 in London. For a while MI5 did nothing except to monitor Nunn May’s movements, with the possibility that he might implicate others. Interestingly, Kim Philby, who had also been at Trinity College, was active as a double agent at the time and was close to being revealed. When it was realised that no more secrets were forthcoming, Special Branch made their arrest. At Nunn May’s trial, he was defended by Gerald Gardiner QC and the prosecution was led by Sir Hartley Shawcross, Attorney General. Nunn May pleaded guilty and through his counsel argued that as a scientist he was under an obligation to see discoveries used not for a single country but for mankind as a whole. A curious statement bearing in mind that the Cold War with the Soviet Union was just beginning. Mr Justice Oliver sentenced Nunn May to 10 years, which was thought by many to be severe, but set down a marker for those who would follow. He was released from Wakefield Prison in 1952, having served six years. He returned to Cambridge and married Dr Hildegarde Broda, the Deputy Medical Officer of Health for the city. He ultimately found some work in a private laboratory but was probably still under surveillance. To his credit he retained and expanded his knowledge of Physics, and was appointed to a Research Professorship at the University of Ghana in 1961 where his family joined him. He subsequently served as Dean, and was a government advisor on science education. He returned to Cambridge in the late 1970s. But what of the spy’s connection with Barnt Green? Alan had an elder brother, Edward Walter, who was born in 1897 and was thus 14 years older. He married Eileen Gerwin, daughter of Margaret Gerwin who lived in our house from 1932 to the early 1950s. Edward had served in the First World War, became a Captain and was awarded the Military Cross in 1919. He and his wife continued to live in the Barnt Green area and he was a Vice President of the local British Legion. We like to think that perhaps Alan and other family members might have got together here in happier times. The events surrounding Alan’s trial were widely publicised, bringing unwelcome controversy to the family. In view of Edward’s distinguished war service it is interesting to speculate whether the brothers were able to retain traditional family ties or whether events had a lasting detrimental effect. Alan Nunn May died in Cambridge on January 12, 2003. Read the full story in The Atom Spy And MI5 by John H Smith, published by Aspect Design and priced £12.